In Redlands communities and surrounding areas, it can be against the city legalities to keep a boat, RV, or other large personal item outside of the home on the driveway or in the city street. Because of these laws, individuals who have boats and RVs and forced to find storage options during the year as well as through the off-season when these belongings are not actively in use. This is why the team of Vines Storage provides individuals with safe, affordable boat storage for the winter months and throughout the summer with easy access options. Boat storage for the winter is one of the most important aspects of protecting such an investment. Boats are rather expensive but can be a wonderful way for families to get together and enjoy spending time with each other during the summer months. However, as the weather gets colder, these boats need to go in storage to protect them from the elements during the winter and allow them to be ready to use come the following summer. At Vines Storage, we provide a variety of boat storage options for individuals in Redlands community. We provide both indoor and outdoor storage units, though many customers prefer indoor storage for their investments to keep them out of the elements and protected during this long-term storage. Our facility also offers the advantages of several amenities that individuals can enjoy using as a customer of our storage warehouse. We offer 24 hour video surveillance to protect your investment, and also provide convenient access hours. We provide long-term leasing options as well as month-to-month solutions to meet your budget and specific desires. We work with our customers to find the best option for their storage needs, whether they need large areas for big investments or small storage spaces for keeping personal belongings. 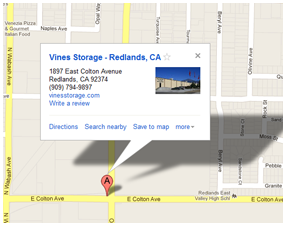 If you reside in or around the area of Redlands, CA and are ready to learn about storage solutions available to protect your investments, contact Vines Storage today. We can provide you a personal tour of our facility and warehouse storage units to help you choose the options best for you and your specific needs.